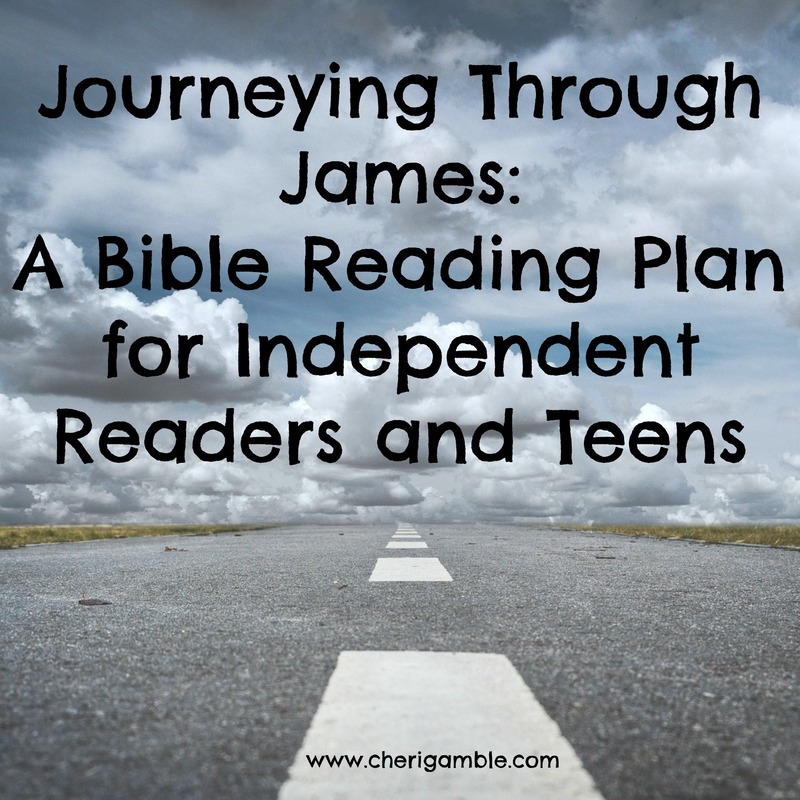 Welcome to Part Three of Journeying through James for independent readers and teens! We are continuing our Bible reading right where we left off . . . on James Chapter 3. If you are new here, you might want to start with James Chapter One. If you want a plan for younger children, you can find one here. ___ Day One: James 3:1-2. Think about it: Verse 2 says that we all stumble in many ways. What are some things that cause people to stumble? What causes YOU to stumble? Pray about it: Ask God to help you stay strong in those areas that can cause you to stumble. ___ Day Two: Jeremiah 1:1-10. Think about it: From reading these verses, what do you think is the most important qualification for being a teacher for God? NOTE: Jeremiah had a relationship with God and he was willing to do whatever God wanted him to do. The rest of the book of Jeremiah shows him carrying out God’s will – no matter what. In fact, Jeremiah faced great opposition throughout his service to the Lord, but God was with him, just as He had promised. Pray about it: Ask God to help you carry out whatever task He has for you to do! ___ Day Three: Matthew 23. Think about it: What type of teacher is described in these verses? How do these verses relate to James 3:1-2? NOTE: Even though the Pharisees had wrong motives, Jesus still told the people to listen to them. Look at what he said in verse 3. What were the people told to do? Why do you think they were told this? I think that perhaps it was because the Pharisees did know the Scripture and they were sharing the Scripture with the people – even if their motives were wrong and their actions were definitely wrong. This also shows how much better things are now. We do not have to depend on a teacher to tell us all we need to know about God. We can have a relationship with God through Jesus Christ without having to go through another person. That was not something that was available to the people back then. Pray about it: Spend time today thanking God for the relationship that we can have with him through Jesus Christ! ___ Day Four: 1 Timothy 3:1-13. Think about it: What qualifications for teachers does Paul give in these verses? Pray about it: Spend time today praying for the teachers and leaders in your church. ___ Day Five: James 3:1-2. Invite one of the teachers or leaders from your church over to your house for dinner. Plan a special meal for his entire family and spend the night encouraging him! ___ Day One: James 3:3-5. Think about it: Has your tongue ever gotten you in trouble? What are some ways that you can control your tongue? Pray about it: Ask God to help you control your tongue! ___ Day Two: Daniel 4:28-37. Think about it: What great boasts did King Nebuchadnezzar make? What about you – are you ever guilty of making great boasts with your tongue? Pray about it: Ask God to help you boast only in Him! For additional fun: Make a green spaghetti meal tonight to remind you of how Nebuchadnezzar was humbled to the point of eating grass. ___ Day Three: Acts 12:20-23. Think about it: What happened to Herod in these verses? Why? How does this relate to James 3:3-5? Pray about it: Ask God to help you remember to always give Him the glory that He is due! ___ Day Four: 2 Corinthians 10:12-18. Think about it: When is it okay to boast? How can you boast in the Lord today? Pray about it: Spend time today thanking and praising God for all that He has done for you! ___ Day One: James 3:6-8. Think about it: What does it mean when it says that “No man can tame the tongue?” What does it mean to tame the tongue? NOTE: While no MAN can tame the tongue, God can help us bring our tongues under control. He can help us control our speech and say the words that will build people up instead of tearing them down. We need to let Him take control of all parts of us! Pray about it: Ask God to help you control your tongue! ___ Day Two: Genesis 11:1-9. Think about it: This passage of Scripture shows that God can control everything including our TONGUES! Notice that, while God formed different languages at this time, He did not force everyone to say only certain words. He gave us language and then He allowed us to say what we want. However, we SHOULDN’T always say whatever we want, should we? What are some times when it might be better to remain silent than to say what is on our minds? Pray about it: Ask God to help you know when you should remain silent and to give you the strength to do that. ___ Day Three: Matthew 12:33-37. Think about it: According to these verses, how important are the words we say? Why do you think this is the case? Pray about it: Ask God to help you to not be careless in the words that you say. ___ Day Four: Colossians 4:6, Ephesians 4:29, Proverbs 10:19, Proverbs 15:1-2, Ecclesiastes 5:2-3, Ephesians 5:4. Think about it: What do these verses tell you about your speech? Your words can either be like SALT, where they serve a good purpose and “taste” good, or they can be like poison, where they hurt the ones who hear them. Which kind of words do you speak the most? Pray about it: Ask God to help your speech be like SALT and not POISON! ___ Day Five: James 3:6-8. Use your tongue to build people up this week!!! To remind you that your speech should be like salt, make a salt painting and then give it to someone who could use some encouragement. ___ Day One: James 3:9-12. Think about it: What are the two opposite things we do with our tongues? What does it mean to curse men? NOTE: Any time we are mean to other people or say mean things to other people, we are cursing men. People were made in the image of God and we need to treat them that way! Pray about it: Ask God to help you treat everyone the way God wants you to! ___ Day Two: Genesis 1:26-31. Think about it: When God created people, He created them special! They were created to be above everything else that was created. They were the ONLY ones created in God’s image! How should knowing this affect the way we treat other people? Pray about it: Ask God to help you remember that all the people you know were created in the image of God and ask God to help you treat them that way! ___ Day Three: Luke 6:39-45. Think about it: What is it that controls what we say? It is our heart that controls what we say. If we fill ourselves up with good, we will say good. If, however, we fill ourselves up with evil, we will say evil. What are you filling yourself up with? Pray about it: Ask God to help you fill yourself up with GOOD. ___ Day Four: Proverbs 18:21. Think about it: How does the tongue bring death? How does the tongue bring life? Your tongue brings forth words that can heal or words that can destroy. Your words have consequences – speak carefully! Pray about it: Ask God to help you bring forth life with your tongue! ___ Day Five: James 3:9-12. Shower a person with compliments! Send him a letter or a text or give him a call and encourage him and let him know how special he is! ___ Day One: James 3:13-15. Think about it: How do we show that we are wise? Can you think of any situation where people think they are wise but they are actually harboring selfish ambition? How can you get true wisdom (remember James 1:5)? Pray about it: Ask God to give you true wisdom. ___ Day Two: 1 Samuel 25:2-42. Think about it: Who had wisdom in these verses? How did she show her wisdom? While you might never be in a situation where life and death depends on your wisdom, you do face situations every day where you have an opportunity to show wisdom by your good deeds. Think through your day. What are some situations where you can show wisdom by your good deeds done in gentleness? Pray about it: Ask God to help you show wisdom by your good deeds done in gentleness. ___ Day Three: Acts 5:1-11. Think about it: How did Ananias and Sapphira show they had selfish ambition? Can you think of any other examples of earthly wisdom in today’s society? Pray about it: Ask God to help you know when you are showing earthly wisdom and to seek after godly wisdom instead. ___ Day Four: 1 Corinthians 1:18-31. Think about it: Often the people who think they are wise are the ones who completely miss the point. They do all they can to think that they can live without God, and even lead others to believe that a faith in God is foolish and only for the simple minded. However, the opposite is true. Only those who have faith in God are truly wise. One example of where earthly wisdom is foolish is in the area of evolution. Here is a video clip from Answers in Genesis that shows the foolishness of this belief. Can you think of any other areas where 1 Corinthians 1:18-31 applies today? Pray about it: Pray for those who think the cross is foolish, and also pray that you will be able to tell the difference between worldly foolishness and true wisdom. ___ Day Five: James 3:13-15. Make a graphic that you can share on social media applying the verses you studied this week. Use a free site such as www.picmonkey.com to create the graphic. 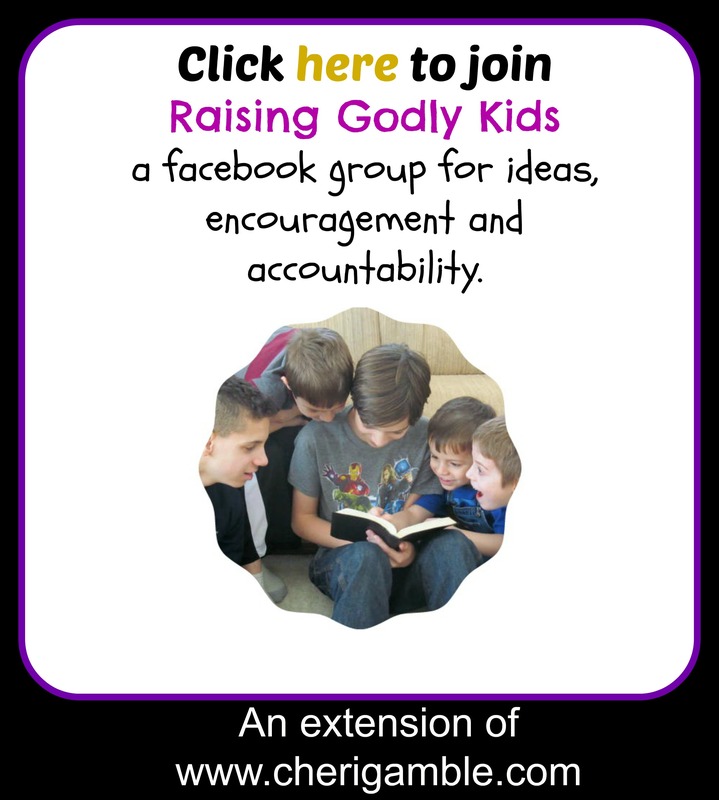 Share it on the Raising Godly Kids facebook page! ___ Day One: James 3:16-18. Think about it: What is the wisdom from above like? How can we get this wisdom? What kind of seed are you sowing in your own life? Pray about it: Ask God to help you display the qualities of wisdom in your life. ___ Day Two: Genesis 4:1-16. Think about it: Cain was jealous of Abel and acted in a way that was certainly not wise. He let his jealousy and selfish ambition take over and, as a result, disorder ruled – just like James said! What are some things we can do to help us not be ruled by sin? Pray about it: Ask God to help you keep sin from gaining control over you. ___ Day Three: Matthew 7:15-23. Think about it: Who did Jesus tell the people to watch out for? How will we know whether someone is truly a follower of Christ? What kind of fruit are you producing? Pray about it: Ask God to help you produce fruit that points to Him. ___ Day Four: 1 Corinthians 3:16-18, Romans 12:17-21, Philippians 4:5, Ephesians 5:21, Galatians 5:22-26, 1 Timothy 1:5-7. Think about it: Today we are going to look closer at each of the qualities mentioned in James 3:16-18. Make a list of those qualities and then write a short description of what each of these verses says about them. Which quality do you need to work on? Pray about it: Ask God to help you grow in the qualities of wisdom . . . especially the ones that you need to work on the most!